Rink Rover: Women's Hockey: from lying in the IOC's ICU to saying "I'll See You in South Korea!" Women's Hockey: from lying in the IOC's ICU to saying "I'll See You in South Korea!" I'll get to the good news after a bit of gloating. The Canadian women's hockey team beat Switzerland yesterday, but Switzerland helped me win Twitter today. Okay, maybe I didn't outdo the rest of the world on social media today, but I did wake up to a pleasant notification this morning. I was tweeting furiously during yesterday's game between Canada and Switzerland, and Swiss goaltending phenomenon Florence Schelling favourited a couple of my remarks. I'm going to interpret the first fave as an endorsement of "gleeful taunt" as the epithet to use whenever discussing Schelling's trademark grin. The second tweet will be a subject for a later blog that will propose one way in which women's hockey could build on the momentum gathered from Sochi. While some commentators still insist that women's hockey is going nowhere slowly, most people who watched yesterday's game would say that the scoreboard didn't reflect how competitive the game actually was. Schelling gave Canada a scare by keeping Switzerland in the game right until the final horn sounded. Luckily for fans, IIHF President Rene Fasel shares the more positive view of the event's progress. In a press conference held earlier today, Fasel dispelled the gloom cast over women's hockey ever since former IOC President Jacques Rogge threatened to cancel it following the 2010 Olympics. Fasel, who also serves as an executive member in the IOC, offered hope for the future of women's hockey by categorically denying that the sport will lose its Olympic status. 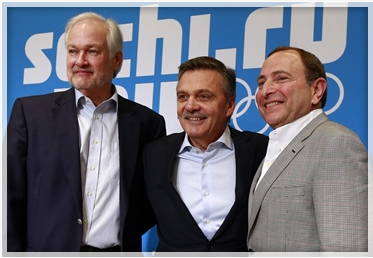 "It will never happen," said Fasel in a surprisingly unequivocal manner--especially given that the conference was held with the two masterful equivocators: NHL Commissioner Gary Bettman and NHLPA Executive Director Donald Fehr. Fasel, in an obvious reference to my blog (just kidding), noted that it took men's hockey decades to level the playing field. He specifically pointed out that it took more than 82 years for Switzerland to beat Team Canada after the first game between the two nations ended in a 33-0 defeat for the Swiss. The IOC decided to be patient with men's hockey then just as it will remain patient with women's hockey now. And, based on this SnOwlympiad, I doubt that it will take 82 years before the Swiss beat Canada. It might even happen sooner than later if Schelling is back in the Swiss crease during the 2018 games in PyeongChang. In establishing that the "IOC is willing to give us the time" to develop women's hockey, Fasel was careful not to fault the competitors themselves for the event's growing pains. Indeed, he commended the female athletes, saying that their "participation has not been a question" as the sport has struggled over the years. These remarks suggests that women's hockey has a complete buy-in from the players; it just needs individual countries and their fans to invest time, money, and pride in their female athletes. As I mentioned in the second tweet pasted above, North American audiences can help out these athletes by clamouring for more CWHL coverage from national broadcasters. Otherwise, the women's game will virtually recede back into obscurity for the next four years.